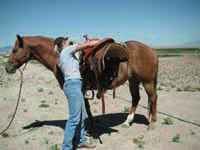 Follow our step-bystep guide and get your horse saddled with the minimum of fuss.1 Tie your horse up before saddling. If he is a fidget you may want to get him used to being cross tied using two lead ropes clipped to either side of his halter and attached to two sturdy posts. 2 Make sure your horse is well brushed with all mud, sweat and loose hair removed. 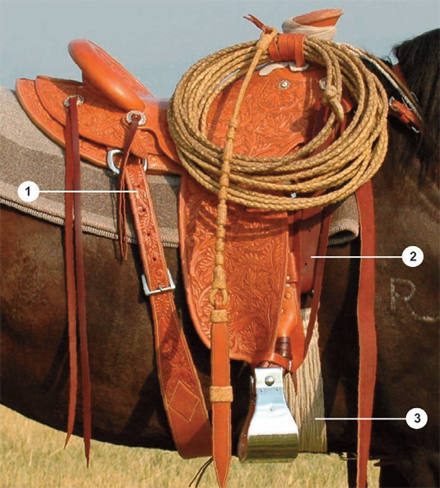 Pay particular attention to the cinch and saddle areas. Any rubs or sores here will mean no riding until they have healed. 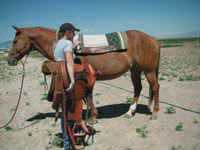 3 Standing on the horse’s left, place the saddle pad on his back, just forward of where it will eventually rest. Slide the pad back into the proper position just behind the withers so that your horse’s coat lays flat. 4 Make sure the offside stirrup and cinch are flipped up over the seat of the saddle before trying to place it on the horse. 5 Still standing on the left side, lift the saddle up and place it gently and squarely on the horse’s back, making sure it’s centered. Going around to the other side, pull down the cinch and stirrup. 6 From the left side again, hook the left stirrup over the horn, then reach under the horse’s belly and pull the cinch toward you. 7 Thread the latigo from the left side and pass it through the ring on the end of the cinch. You may need to do this twice. Pull out the slack and fasten it off like a belt. If you need to tie your latigo, then thread it around the back of the D ring to the left, bring it around to the front then back through. The end should come through the middle of the D and thread down behind the loop you have just made (like tying a tie). Pull tightly again. 8 If there is also a flank billet (rear cinch) fasten it so that you can fit a hand between it and the horse. Also, make sure to connect the rear cinch to the front cinch with a strap. If you don’t, the rear cinch will slide back and causing the horse discomfort. 9 When you are ready to ride, untie your horse, put on his bridle and walk him forward a few strides. Go back to his cinch and tighten it up before mounting. Stand by the horse’s left shoulder with the saddle on your right hip. Your right hand should be on the off side of the cantle, while your left hand is on the near side at the base of the fork. Place your feet shoulder-width apart with your left foot forward and near the horse’s front hoof with your right foot slightly behind your left foot. To build up some momentum, rock your body back and to the right three times. As your body comes forward from the third rocking motion, pivot your torso so that your stomach faces the horse. Swing the saddle up and over with your right arm, as if you’d like to give your horse a hug.